When we became beagle “owners,” one of the first comments we heard from a knowledgeable dog lover was: “Beagles are the ‘best bad dogs.’” If you’ve read any of DamnBeagles.com up to now, you have an idea what that means. 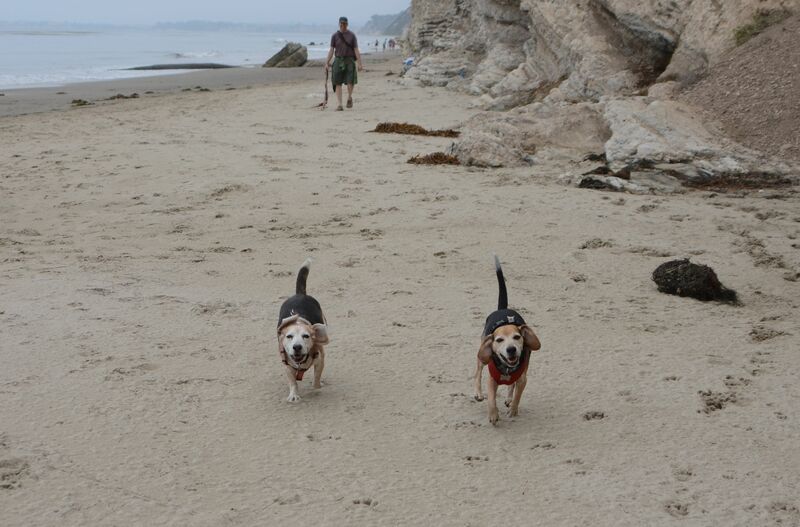 The latest escapades of Harley and Scooter occurred while we were taking a 4th of July weekend vacation to Southern California, where the beagles nearly went on a long unsupervised side trip of their own. We went to a nice park called “The Douglas Family Preserve” in Santa Barbara, where there are acres of trails and dogs are mostly allowed off leash on all of them. 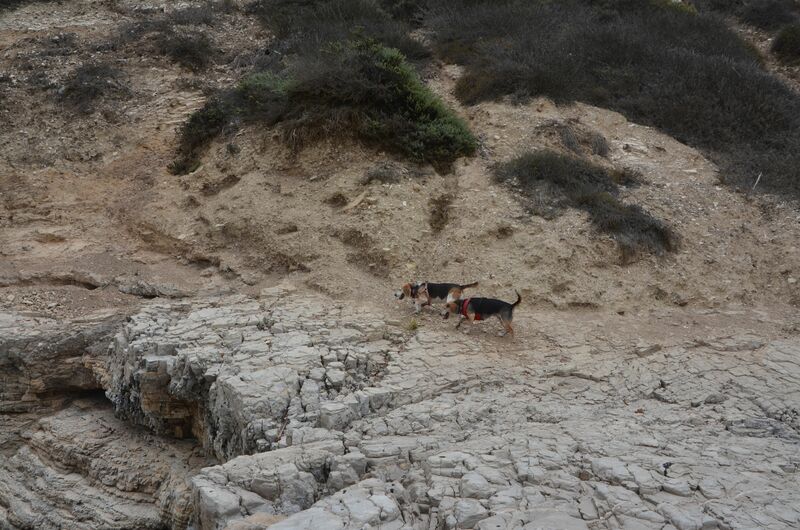 Since our dogs are BEAGLES [yes, with capital letters], we had them on the leash the whole way. They still have a great time, but we don’t have to chase them down. 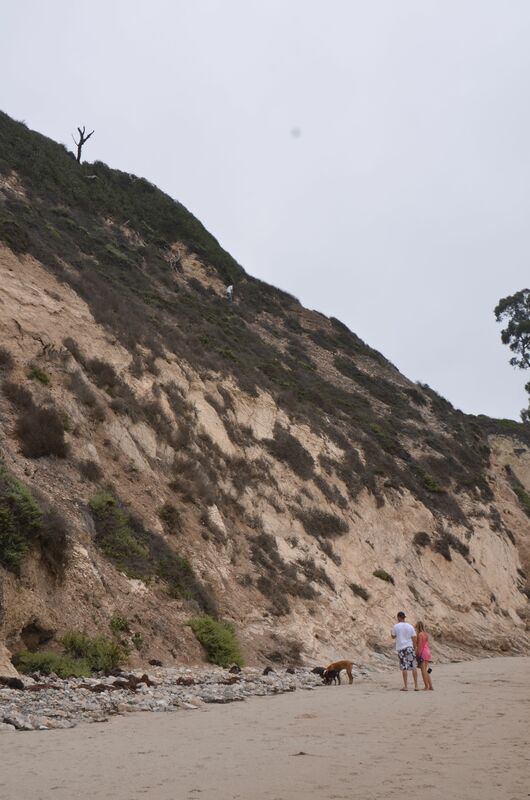 Douglas Family Preserve is on the cliffs overlooking Arroyo Burro Beach, a lovely Southern California beach that has a sign at the entrance pointing to the left to run off leash or to the right to be protected by the lifeguard station and enjoy the wider beach areas. We walked the BEAGLES far enough from the on leash and parking lot area that we could cut them off at the pass, if necessary. We took off their leashes, each of us keeping one of the leashes in case we had to chase someone down. Which we did, of course, several times. Both dogs found dead fish, including a rather large piece that may have been over 100 pounds worth. Funny thing: none of the other dog owners seemed to need to chase their dogs off dead fish flesh. We made it fairly far down the beach with little trouble, at least on the scale one gets used to with BEAGLES, turned around and headed back. Pretty soon Harley decided the beach wasn’t interesting enough for him and he climbed some rocks until he got stuck. I went over and helped him down from the about seven foot high rock ledge, we laughed and kept going. Not three minutes later he started up again. 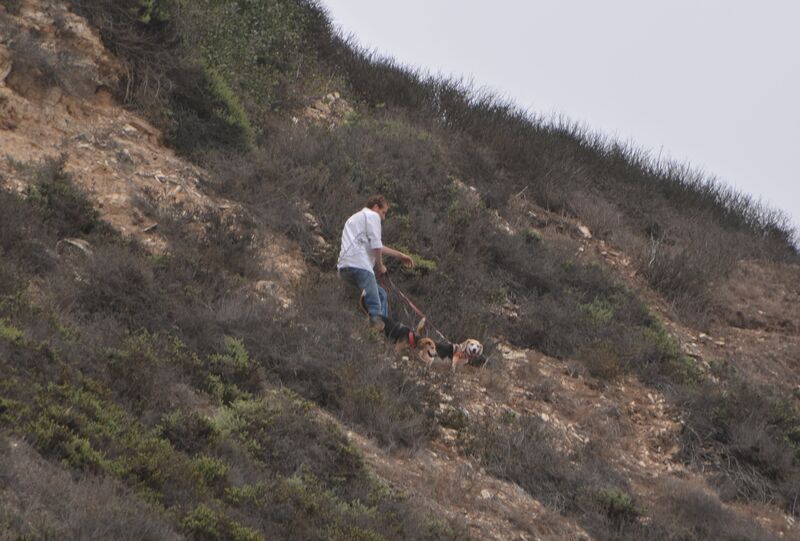 We called after him, and he kept going along the side of the cliffs at about a 40 degree angle. Scooter started to follow. We called some more. They kept going. We were all following their progress from below as the two went farther along and up the cliff. Fortunately, a young man was there to become the hero of this story. His name is Kurt and he was in Santa Barbara the weekend after the fourth with his girlfriend Sasha. Anybody know a young 20s couple like that, please pass on another round of THANK YOU SO MUCH FROM THE BOTTOM OF OUR HEARTS. 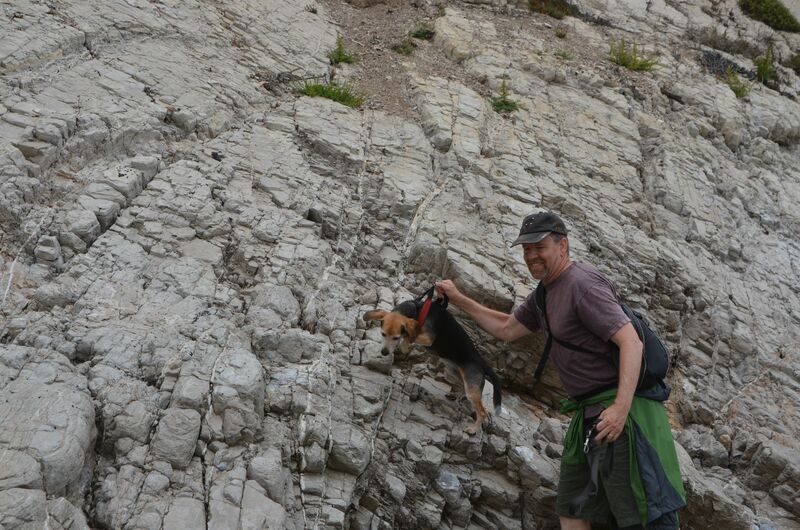 He asked for the leashes and climbed the cliff that I couldn’t [Sasha said he has “monkey feet”]. After following them along the cliff path for a ways, he called the dogs and they decided he looked interesting enough to stop their trek and say hello. They are very used to leashes, so Kurt put them on easily and lead them back to the washed out section he had climbed up and was able to bring them down. I have to confess, my Dad’s old saying when any of us kids threatened to run away definitely came to mind in the days after this adventure: “Don’t let the door catch you in the [behind. 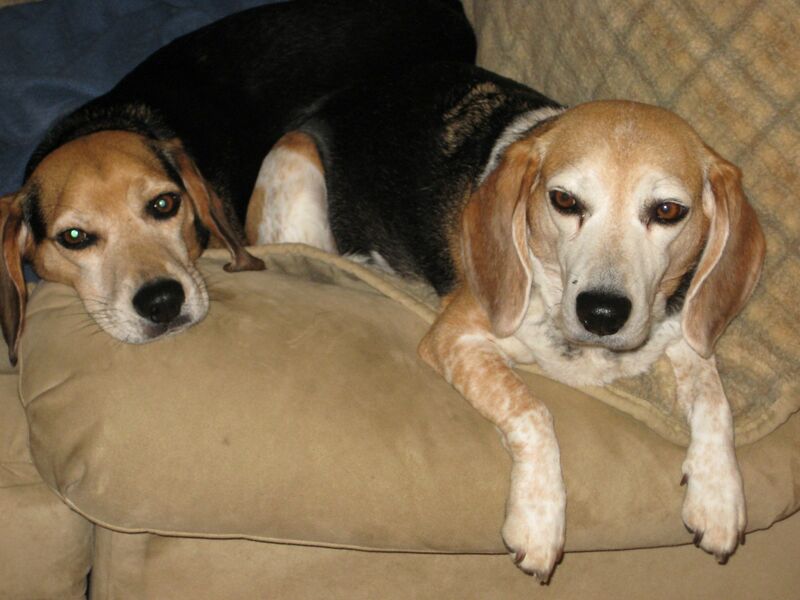 ]” There were thoughts of life post-BEAGLE, and where the two little darlings would end up. 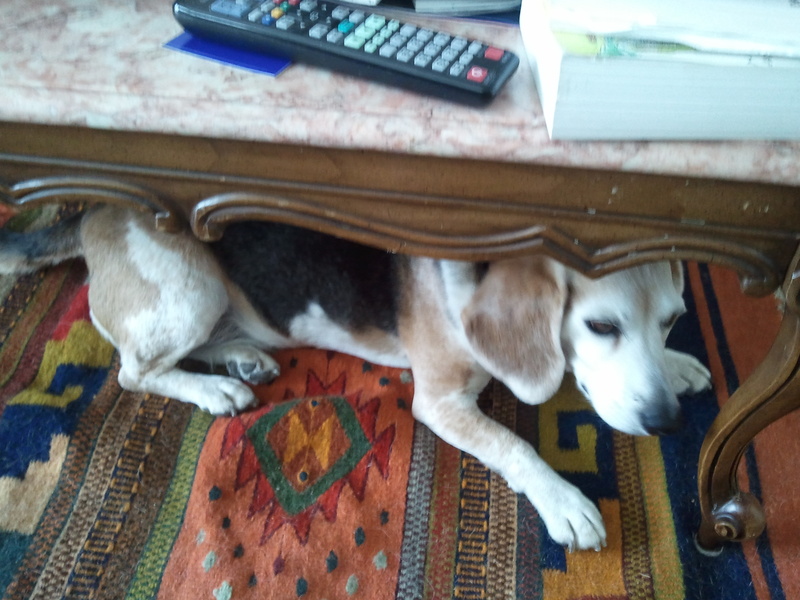 With beagles, there is always some new act or (mis)behavior we have to train out of them. More often than not, we simply end up adapting to it. Harley jumped up on the table a few times when we first adopted them, without the use of a chair! But we’ve never caught him doing it since then. Who gets on top of tables? Not me! Another time we came home to find what was left of gum packages on the dog bed. The plastic wrap had been torn off, and a bunch of pieces of gum had apparently been eaten, but not too many. Again, we watched both dogs closely, but especially Scooter, as she had the freshest breath! Gum can be bad for dogs, especially if it contains the sugar substitute Xylitol (this gum did), which can cause liver failure. But the strangest item to be taken off the table was a camera memory card, full of pictures from a recent trip to Ethiopia. We don’t know if some salt or sugar that was on the table spilled onto the plastic case that contained the memory card, but regardless, we found a chewed up card on the floor one evening. Luckily for Scooter, the photos had all been downloaded. Hopefully we can close this chapter of beagle behavior, but we’re not holding our breath! In the meantime, Harley and Scooter have trained us not to leave anything on the dining table. Who, us, get into trouble? I was recently out of town for work for a week and a half. Fortunately we have technology to keep families close. Mike and I talked via Skype, and I got to connect with him and the pups that way while I was in Montreal. It’s hard being gone from “my pack” for any length of time. But in some ways it is more difficult for the one left behind to take care of Harley and Scooter. Twice a day feedings, walks, buying dog food, scheduling times with the dog walker, etc. Oh, and lots of time cuddling on the coach! Harley likes to think he’s a tough dog, but he’s really a big baby. 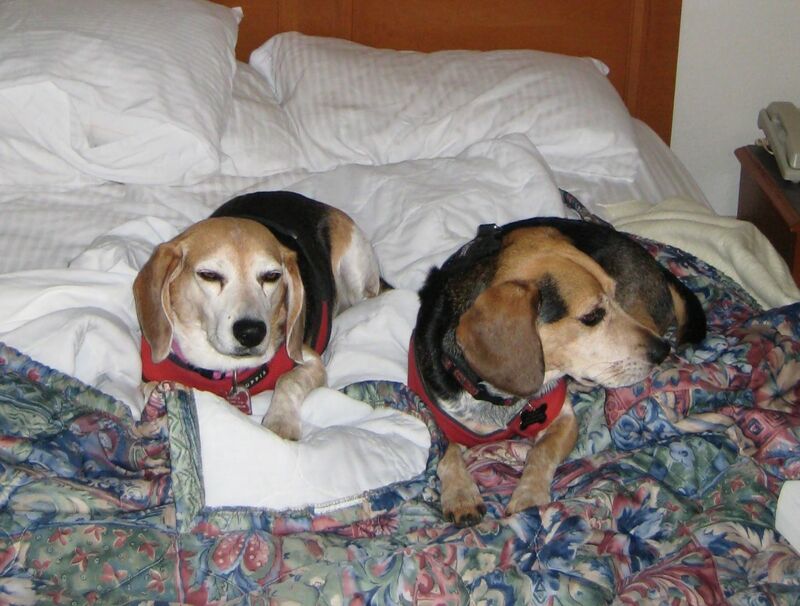 I would get emails from Mike with photos of the beagles, and he would relate how stubborn or bad they were being, or gross or annoying. And how they woke him up in the middle of the night barking and hunting (that’s Harley). Scooter even got up on the dining room table! That’s a new thing with her. Now we have to make sure the chairs are pushed in and there is no food or anything dangerous she might ingest. So in addition to having to hang up our garbage bags far from their reach, locks on the lower kitchen cupboards, not leaving our backpacks out, we now have to remember to push in our chairs. Beagles! Despite the complaints, I also heard all about how sweet they were, the greetings they gave him when he came home, how he stopped off to buy them some special treats. Mike loves them even more, I suspect, because they drive him crazy! Of course, the same thing can be said about me. Harley and Scooter are stubborn, willful, and often disgusting dogs, but somehow that endears them to us. Being cute and lovable doesn’t hurt either! I’ll be on the road again soon. I’m sure I’ll soon hear all about their misbehavior, and in the same breath, just how sweet they are! Some of the best examples to convey Harley and Scooter’s stubbornness? Another example is taking them for walks. They can be slow walkers due to all the sniffing they want to do. And if there is something they really want to sniff or see, they plant their paws and throw their weight down and won’t budge. Scooter is especially good at this. And given that she’s heavier than Harley she can be hard to move. Harley at least is skinny and has ADD and can be distracted easily; Scooter, not so much. She’ll give us a look that says “Hey, I’m not moving yet, I’m sniffing here.” We either let her sniff or have to drag her away. These are some reasons why beagles are usually on leash. They know when they are being called to come, but they have other things on their minds and will ignore you. So unless treats are involved, they rarely come when called. Priorities, right? In the beagle world, however, “S” is also for sweet, squirrel, and sniffing. 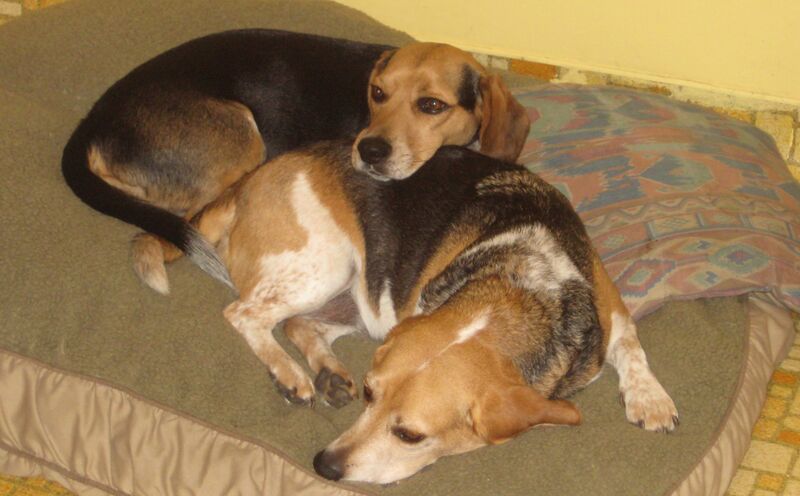 Especially sweet – Harley and Scooter are the sweetest beagles! 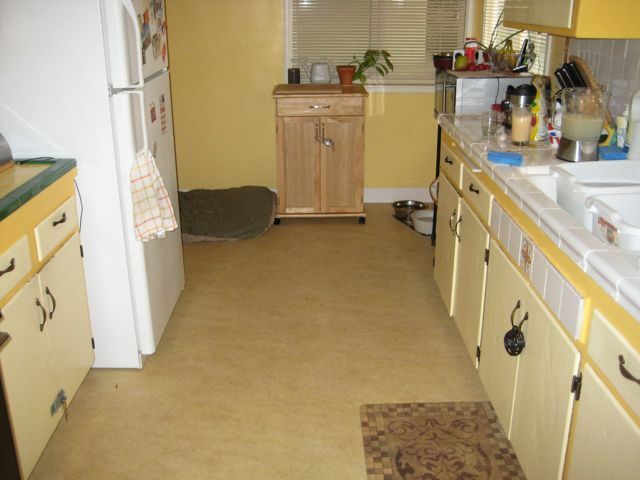 Our dogs are most definitely spoiled, and perhaps no more so than in terms of their diet. Since Harley and Scooter joined our family, we’ve made sure that they’ve eaten a healthy, organic dog food. 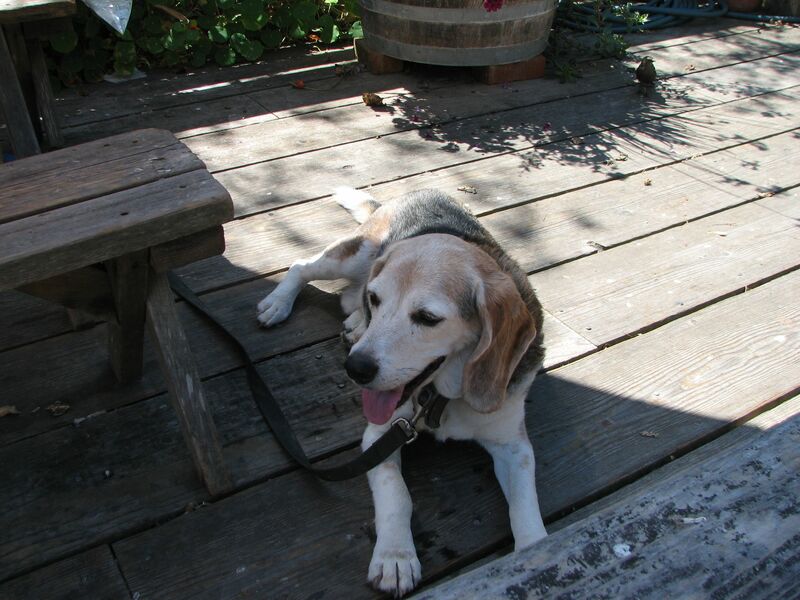 This is mainly because of our last beagle – beloved Gus – died from a liver tumor. He was 11 yrs old when we adopted him, and he came to us having been on a diet of Pedigree dry dog food for most of his life. You know, the rather cheap stuff, but we figured it was okay. Until he passed quickly from our lives. We’ve always wondered if that cheap dog food had something to do with Gus’ tumor. So when Harley and Scooter came bounding into our lives, they’ve been given the red carpet treatment where food is concerned (and yes, every other area too!). A couple of years ago our dear friend Renee told us of the benefits of feeding dogs a raw food diet. So we began buying pre-made patties for them. Talk about living high on the hog. They eat better than we do! All organic ingredients, stocked with lots of veggies, and you can buy chicken, duck, pheasant and even rabbit (sorry Pat and Karen), though we primarily buy chicken. And because the patties are ready to go, all we do is stuff some in a kong (best invention ever for dogs) for their breakfast and dinner, and voila, dinner’s ready! They definitely love it. 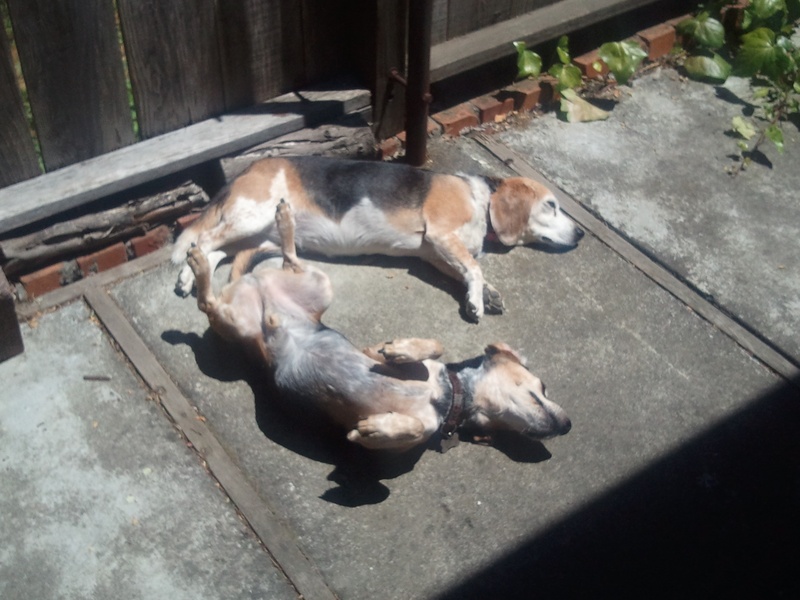 However, they pretty much like everything and being beagles, consider garbage and cat poop delicacies. They are not discriminating eaters by any stretch of the imagination. Since Harley and Scooter have been on a primarily raw food diet (they still get non-raw biscuits and other treats) they’ve had very healthy and shiny coats and better digestion (we won’t go into details). You can read more about the benefits here. It’s not too expensive and worth the investment, as we just want these sweet pups to be with us for a long time. It’s All About the Hunt – Arooo! 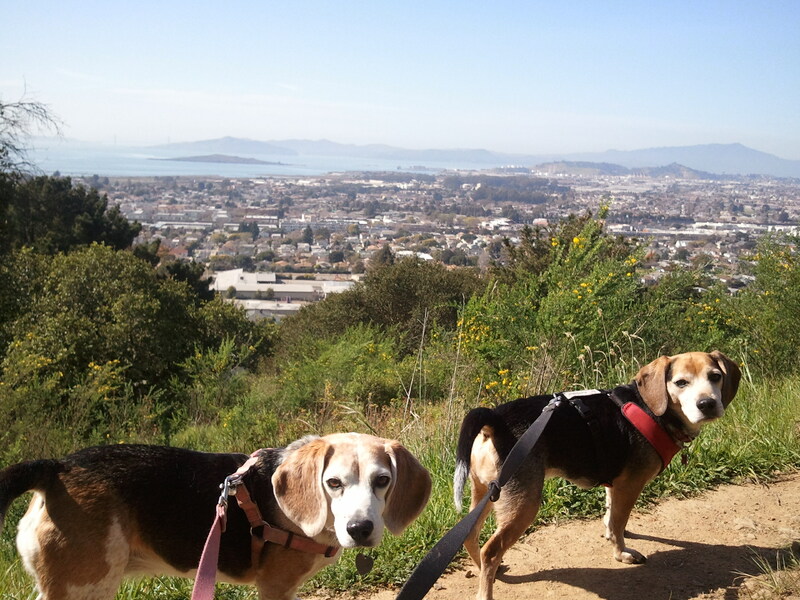 The sound of beagles baying and howling is a frequent part of our walk with these two. They were born to hunt. Most days we walk in the regional park near our home. The scents they find there! Cats, gophers, deer, wild turkeys, the occasional fox and coyote, and lizards (yes, they like to hunt the poor little lizards). You can tell when Harley is beginning to get into his hunting mode – his tail starts wagging like a metronome, his sniffing sounds like a sucking noise, and he starts barking and baying. A lot and loudly. Scooter is more of a quiet hunter, but if there’s a very strong scent, or she sees something, like a cat, she will let out a high-pitched howl–almost a shriek. It’s very entertaining and often hilarious to watch them hunt, except when they are pulling my arm out of its socket in chase of whatever they see or smell. We were in our park, near the top of an incline. Fortunately I saw the cat first, and braced myself for when the dogs caught whiff of it, but despite holding on tightly to their leashes, I was pulled downhill at breakneck speed. Thankfully I had on good hiking boots, as the path was still damp from previous rains. The chase probably only lasted 50 seconds, but boy, was I praying that I wouldn’t fall flat on my face. I’ve suffered a broken wrist and jaw before and would be quite happy to never go through that experience again. And even though between the two of them they only weigh about 50 pounds, Harley and Scooter are strong little buggers. They simply go crazy when they see potential prey. Never a dull moment with these two. Wonder where they will drag us to next? Another day, another break-in. Fortunately canine, not human thieves. As Mike recounted in an earlier post, the beagles have conquered many a garbage can. This time, it was a kitchen cupboard. It’s where we used to keep packages of rice, pasta, sugar and other staples. We even put a padlock on the cabinet, but since we get into that particular cupboard fairly often, we sometimes forget to lock it. I forgot one too many times to put the lock back on and came home on one too many occasions to find rice or uncooked spaghetti scattered all over the floor and partially eaten. (Luckily the dogs either didn’t eat enough of it or were more or less okay from it.) After that, we removed any food items that weren’t in a can or jar–containers we assumed the dogs couldn’t open. For Pete’s sake, sometimes we have trouble opening those jars! On a recent weekend I temporarily put some bags of dry lentils in that cupboard, put the lock on, albeit not all the way locked. When Mike and I returned we found black-eyed peas everywhere! Later, evidence turned up that Scooter had indeed eaten a bunch of black-eyed peas. The incident that really got us shaking our heads was the time I thought I smelled pizza on Scooter’s muzzle. When I made my way into the kitchen, I found Harley licking up spaghetti sauce off the floor with just a small amount of sauce left in the jar. We’re talking a 25 ounce jar of spaghetti sauce that Scooter (we know she’s the instigator) somehow cleverly got the lid off. It was a brand new jar that had never been opened. A friend surmised that since I had found the unopened jar in the living room the day before, the cap must have somehow loosened or the seal inside popped. Still, how a creature lacking opposable thumbs managed to get a lid off a jar of spaghetti sauce that I struggle with is a mystery to me. 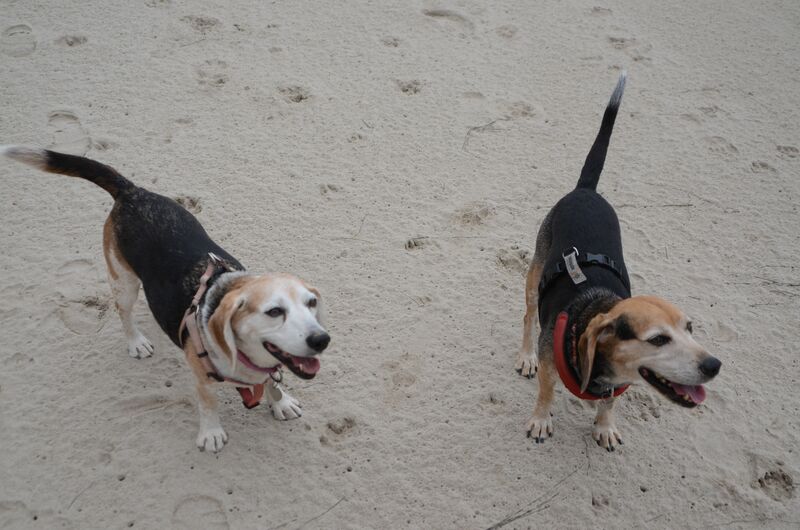 With these two beagles you just never know!